Thanks for the (well written) informative and summing post re: Arctic and smoke related atmospheric methane. And the need for more monitoring and reporting of this ominous situation. Russian scientists believe a giant crater which appeared in far northern Siberia was caused by rising temperatures in the area – not a meteorite. Andrei Plekhanov, a senior researcher at the Scientific Research Center of the Arctic, said the mysterious hole which appeared in the gas-rich area earlier this week was most likely the result of a ‘build-up of excessive pressure’ underground, due to the region’s changing temperatures. On Wednesday, Mr Plekhanov traveled to the 262ft wide crater, in the Yamal Peninsula of northern Russia, to study how the crater was formed. Real climate covered methane in a 2012 entitled “much ado about methane”. I think it’s worth reading that post, as well as all the comments from the scientists in the comment’s thread. Go to http://www.realclimate.org and type in “methane” in the search box, and “much ado about methane” is the top post. The scientist’s response to commenters in the comment section are in green type. Read it. I think Archer may end up being a bit conservative RE his model assessments. Actually, Doug, the more I think about the current science on this issue, the more I find it to be rather silly. You have one group that argues there will be no response to a powerful Arctic warming from methane sources for thousands of years. You have another group that argues that instant catastrophe is nigh. There appears to be no middle ground and neither group is really talking to the other. Each has retreated into their respective corners. In addition, the notion of very, very slow response is based on model assessments that have very strict physical parameters, that assume no catastrophic failure mechanism in substrata that contain the methane deposits, no mechanism for warming transport. It’s as if the mud/earth is a perfect insulator that contains no cracks, no uneveness, no localized warming. The position Archer takes on Methane is similar to the position some scientists took some decades back regarding ice sheet response — that it would take many centuries for even a moderate sea level rise due to ice sheet melt despite the evidence plainly available in the immediate paleoclimate science at the end of the last ice age showing periods that, even under the moderate pace of warming seen then, where sea level rise hit ten feet per century. Nor did it take into account the fact that even under the ‘slow’ pace of current warming we will see temperature increases in the range of what was seen during the end of the last ice age in less than two centuries (not 10,000 years). The notion that there would not even be a moderate methane feedback this century under a regime of warming in the range of 2-7 C and 5-15 C in the Arctic is quite outlandish once you consider the actual physical processes involved and the fact that heat transfer finds a way to take place in nature even if it doesn’t in simulation. Arctic amplification, overall, involves a number of feed backs. As for a strong signal appearing this summer, I think that might depend on the fires. But it seems there’s some feedback happening now, yes. My opinion as well. I think we are past the tipping point. Now I suspect it is a matter of how far it goes. Unfortunate. I wonder if CARVE has been shut down. I think the chief investigator Dr Miller might have moved on to Harvard? Schmidt was one of the scientists that together with Archer have consistently said that large methane releases are not a problem at least in the near term (geologically) and has been at odds with S&S and other scientists who have said it is a potential problem. On top of that, methanetracker.org had effectively shut down and I am not sure if it has re-started up again. So the issue of methane has been quitely pushed into the background, nothwithstanding earlier observations and science indicating methane releases well above what IPCC indicated should be happening and that there was serious under-reporting in USA. Lots of sensors getting shut down. Toas crippled, Keeling defunded, methanetracker gone. I wonder if the one thermometer in Mobile Ala will get defunded as well since it is not following the party line. Not a good state for the science to be in. There’s a kind of trench warfare going on over methane. I honestly don’t understand the Schmidt/Archer stance and hope it hasn’t colored the NASA focus. Apparently S&S and around 80 other scientists are now on a research ship in the arctic doing science. Will be interesting to see what they as a group find. Shakhova did have a recent statement. Apparently, they found methane plumes in shallow water that was only recently submerged. The Silence of the Labs huh? Robert’s exposition on paleoclimate above is what makes me suspect that the modellers may be too reassuring on this. They argue that no such release occurred in previous interglacials of course, but I would have thought that the forcing was smaller and occurred over a vastly long time period, giving ample time for any released methane to break down. The fact that we are already at methane levels of 1850ppb when previous interglacials were at 700ppb argues that we have already had a substantial effect and that a further significant percentage rise could indeed occur. Who is behind the defunding, is this coming out of congress, and if so, what is the congress person(s) name(s) who is pursuing this defunding? In other words, who does one call to voice opposition to this action? Regarding methanetracker.org, I was of the understanding that it needed something less than $10,000.00, that’s damn near a bake sale. Can that still be publically funded, and if so how much is needed? $10k? Koch bros make ~$6 mil / hour (each). That represents 6.0024 seconds of income for one of them (3.0012 seconds of income if both brothers are factored in). I think it is difficult to pick a ring leader for defunding in Congress, perhaps Exxon? Methane Tracker should probably do a kickstarter. I’d support it. Call your Congressperson and voice your opinion that scientific research for climate change, CO2, methane and other greenhouse gasses should be fully funded and see their funding sources increased. If you’re asking who, it’s practically anyone who’s a republican, conservative or libertarian. I say practically, because there are a few who disagree with the overall assault on scientific research into climate change. But they’re mainly a token element at this time. Remarkable photos have been posted to the Nwtfire Facebook page. Officials in Siberia banned residents from setting foot in the local forests and declared an emergency situation in light of the rapid expansion of forest fires in the Buryatia region. “For the duration of the emergency situation, entering forests is strictly forbidden for the population,” and punishable by fines of up to 100,000 rubles ($2,800), the region’s forestry department said in a statement quoted by Interfax Friday. Forest fires have spread over an area of 2,778 hectares in the past night — effectively doubling the area that had been covered the day before, the report said. Nature reserves Zabaikalsky and Barguzinsky were among the areas affected by the flames, Interfax reported. The hole is closer to 100 feet across than the early reports of 250 or 300 feet, though it appears to reach that in depth. The researchers think it may be part of the natural processes that created the many lakes in the Yamal area. There are several theories as to the actual process of formation, of which the most credible may be that a pocket of natural gas (plentiful in Yamal) combined with water, salt and rising temperatures to burst with enough force to splash debris dozens of feet in all directions. Research and exploration is ongoing, however, so more complete reports should be available soon. Thanks Bob, best explanation yet. Lakes in north form from pingos , this ejecta around the hole is not what we see, It may be “natural”, but it sure ain’t “common”. I have never seen a lake on the permafrost that looked like a moon carter. The great thing about this video is one can see the permafrost in great depth. If this thing is 2 years old , I’m a senator from Oklahoma. So do you think it’s spontaneous hydrate destabilization? Shear frozen walls of permafrost. It’s like a shaped charge blasted through the thing. You know, Bob. If you look at the video, a small stream appears to lead up to the hole. I wonder if the water found a weakness in the thawing tundra and hit a frozen or captured gas pocket below, causing the ice lattice to catastrophically destabilize? That was before today’s pass over . Well , they lowered a GoPro camera out of the helicopter yesterday into the thing , and sides are smooth, with water just starting in mark them. If it’s 2 years old , There should be deep grooves into the throat where newly exposed permafrost is seeing the atmosphere for the first time thousands of years. That smooth throat proves it’s very new. This is a hell of geologic feature. And it ain’t 2 years old. Well, yes, there would certainly be erosion and you can see the permafrost just starting to melt along the sides. Would probably be a lake in a couple of years, or well on its way. It would be interesting if it was possible for clathrate deposits in the permafrost to explosively release too – it’s pretty clear it’s possible for that to happen at the sea floor, but I’d always tended to assume permafrost would be immune. But really – why should it be, if it starts to melt? If there is a pressurised gas front and the frozen permafrost is mechanically more stable than the slush left as it melts, why wouldn’t we expect the same on land? Not gone entirely. It’s just that the coverage is degraded. The AIRS methane data is no longer easy to access publicy. The flask measurement reporting frequency at point sources is noticeably down. CARVE appears to have been shelved. We still have the METOP data and the flask measurements from ESRL when they update. I wouldn’t call it a cover up. It might be more due to a conflict over limited resources and a probably somewhat rational prioritization of CO2 (as it is the primary driver). But methane is a key feedback and taking the eye off that ball gives us a less complete picture. A conflict for funding is of course a sort of cover up, if not deliberately conceived as such. I’m sure there’s still plenty of money available to bolster security services to cope with unrest and to research new ways to extract fossil fuels? In the metaphor, CO2 is the tortoise, methane the hare. That said, though CO2 is the prime, long-term driver, methane can radically change the short-term dynamic. Due to that potential volatility, I’d say it merits a good, hard look. In any case, I think we should see all carbon cycle gasses as important. But what happens will, in many ways hinge on the rate and magnitude of methane response as well as associated global carbon store response (CO2 + CH4). If we ignore the methane part of that equation, it’s a pretty severe blind spot. If we assume that models are entirely correct and degrade monitoring, I’d say that’s a fundamental error in judgement. As for what you say about how we choose to allocate resources, I couldn’t agree more. My primary concern being that far more resources have gone to fewer and fewer non public interests than is healthy for an effective overall response. If the choice is between a tax cut for the wealthy, for example, or funding a fundamental science such as climate change, the choice we need to make is for the science. Not only is the allocation of resources nonsensical already – but worse – the trends are the wrong way, funding for climate science seems to typically be being reduced currently. As with so many other things going on – it’s really hard to find trends going the right way… virtually a collective suicide pact. Under the current political and scientific funding climate, it’s understandable why there would be a kind of issues trench warfare. That’s a bad state to be in, fighting over a diminishing pile of funds. You’re less likely to end up with good science in such a state. That would explain a lot of things. We know this whole region is “gassy” . We know it has very very hot there for several years, Remember , Igor Semiletov made expeditions East of there , and found kilometer wide out gassing on the seafloor . I think this hole can be linked to what Igor Semiletov found east of “The End of the World”. On the sea floor the weight of water will dampen this out burst , but on land it will blow sky high. Let us hope they had a methane detector taped to the GoPro, yesterday. I fear, the methane monster will come out of the box . This hole in Russia makes me more fearful . If Siberia keeps getting hotter , these pimples will break-out like a 14 boy all over the North. We have not seen the last of these. I don’t think the water column would stop an outburst of this kind. There’s some evidence for it having happened off New Zealand in the past. Very large craters blown right off the ocean bottom. One hypothesis is methane destabilization. If these are blowing out of the sea floor , the water will dampened the outburst. . Different gas levels make different holes , just wait for the day we see one on fire . Because lighting touched it off. And the helicopter flies over , and it’s burning like a fire pit in LA. I see a world , where large holes in the ground burn year round in the far North . We do not see that today , but it could be apart of the Earth very soon. We don’t what any smokers to walk up to these holes. They could blow the whole effort off the map. And that is just the start, as one approaches this thing , any spark will touch it off . All the crab fishermen smoke . All the Russians smoke. I’m going to reserve judgement to see if more holes form, but they have been predicted to occur due to permafrost melt and are the genesis of the compost bomb hypothesis. It would particularly make sense for there to be water flow where the crater formed, for the same reason that melt water is accelerating Greenland glacier movement: warm water can penetrate deep into cracks and cause subsurface temperatures that are warmer than surface temperatures. For the permafrost, these dynamics are even worse since the melting unleashes anaerobic processes that generate their own heat. Once it starts, there is really no way for it to stop and it can even potentially continue through winter. This is why I think the official line on methane is extremely short sighted. However, there is also no evidence or even model (as far as I’m aware) that supports catastrophic release that would cause near term extinction. The middle ground I’ve read suggests near term (within two decades) release of 100-200 MT/year and ramping up to 1GT. By 2050 or so, these releases would be adding forcing about equivalent to CO2 contribution; however, on a net forcing level, it would nearly double. This is an issue generally, since an enormous percentage of CO2e forcing is counteracted by aerosols and such, each incremental increase in CO2e going forward will contribute double or even triple the net forcing per unit that we have been seeing. When you add everything up, it suggests that climate sensitivity is around 6C, which is what Hansen believes (and was actually the expected number for a long time) as well as Robert’s reading of paleoclimatology. Thanks for the context, Mikkel. This is generally what I’d expect as well. But I’d really like to see the science take an honest, hard look. I’d think that with methane as one of the prime suspects for the ESS response and overall sensitivity to a given heat forcing, that we’d be taking a good, hard look and not backing off efforts. How all the related feedbacks bear out in geophysical and climate effects are bound to seem quite radical even under a regime of 5-6 C ESS. We look at these numbers on paper and it’s tough to see the magnitude of physical impact from such a change. Regarding the higher methane concentrations above the forest fires isn’t that what you would expect in any case? In addition to the raging fires there are bound to be lot of low intensity ground burn (dirt fires here, don’t know the English term). Such low intensity fires in a low oxygen environment is ideal in producing methane which isn’t consumed by the fire. If the fire was intensive enough to tap some underground methane source i for one would expect the fire to burn it as well. Sorry if all this comes out as inane dribble as i am venturing far beyond my area of expertise here. Whatever the scenario may be the news are unfortunate either way. With forest and paddocks stretching to th horizon, no tv, and seriously dodgy internet connection, I have a very small window to the outside world so the information that comes from all of you on this blog is kind of important to me. The record 2012 melt season coincided with the worst fire year on record for Siberia. There’s a strong heat feedback from all the black carbon loading in the atmosphere and the particulate reduces albedo if deposited on ice/snow. So a strong fire season would push toward more ice melt. Overall, we’re near new record lows for the day in extent. The area values are tracking along 2009 lines. It would take a rather strong decline going forward to hit new record lows this year. Continued very large fire outbreaks would tend to push the ice in that direction. Posted this on NBL. Great job Robert! Thanks CO Bob and other commenters too. You guys getting a bad link in the blog post? For some reason the embed code doesn’t appear to be working on my end. It comes right to here when I click on it. i’m no tech guy and wouldn’t know how to fix such a thing anyway. Looking good now. Must have been my browser. The sink hole and permafrost. Thanks for the report Robert. Please find below an experimental re-edit I did of differing methane news, plus a ‘wrapper’ speculating about how the human psyche reacts to this kind of potentially lethal news. Excellent and chilling video, Sven. 70 feet of SLR within 100 years would be very rapid. However, Box is right RE the paleoclimate climate record. Sea levels were between 15 and 75 feet higher than today when CO2 ranged between 390 and 405 ppm during the Pliocene. Of course, we could be at anywhere between 500 and 900 ppm CO2 and 600 and 1500 CO2e by that time. So we’d be in the range where all the ice is slated to melt. The key question, as Box notes, is — how fast? I think it’s worth noting, from the sea ice perspective, that this year has been very unfavorable for melt. We have Fram Strait retention of sea ice. We have NAO in a configuration that pushes for retention if sea ice. Wind regimes and PV all pushing for ice retention. Despite this, surface temps over even the far north have been average to only slightly below average, and overall Arctic temps have remained above average. We have Arctic buoys recording basal melt in places like the Chukchi coincident with warm water upwelling. And we have much warmer than normal water temps encroaching the sea ice on all sides. Extent at 3rd lowest on record now, area tracking in line with 2009/2010. What this implies is that any switch toward traditionally melt favorable or even melt neutral weather conditions would shove the ice hard toward melt. And if waters continue warming up as fast as we’ve seen over the past decade or so, it won’t matter what weather conditions we see, the overall heat will over-ride. The only major negative feedback capable of breaking the trend is large outflows from Greenland. In any case, I probably need to blog about how weather conditions have not tended to favor Arctic sea ice melt so far this year. It’s kinda like the ice has backed into it’s last corner and giving a few good final slugs before going down. That’s the thing that’s hard to get across–even in years where the weather is very unfavorable for a big melt, we are in the top ten lowest extent, area and volume numbers at the end of the season. This is not your grandfathers Arctic! They’ll do their best to point cameras exactly where the ice is and nowhere else. The weather is very unfavorable for melt and we have 3-7 lowest in most records. If it tips to favorable, we get a record year. In any case, GIS melt will probably result in both local cooling and in increased ice cover near the ice sheet. So climate change deniers will probably have a field day. Welcome home, Robert. Yes. Our dear Arctic is giving its’ all. On the ropes. If I could smear some liniment in its opponents eyes, I would. The methane burkha for Gaia? CARVE, at least, is still ongoing and that was a bit reassuring to hear. Not a general proponent of conspiracy theory. My view is that we can get in trouble when we aren’t honest with ourselves, make blind assumptions, and let profit motivated interests lead the way. WEBLOG with forty men on a boat expedition to the Arctic Ocean. Jorien Vonk, nature and climate scientist at the University of Utrecht, take seven weeks samples from the seabed at the North Pole to investigate. Permafrost During the journey she shares her field notes with the Volkskrant. Since first half tonight we sail around in an area in the Northern Laptevzee, known for methane escaping from the seabed. Igor Semiletov, one of our chief scientists on board, studying this area for a long time. This time we want to better bring the phenomenon is: how much methane escapes here, and where is it exactly? There is a big load of equipment on board to investigate this. We now use the fishfinder , which the water below us is scanned. Sometimes we see bubbles and small turrets of bubbles coming up from the seabed. Before we go somewhere to anchor for a mega station, we scour the area well. The clouds are high, so the visibility is good. The sea is stable and the wind is weakening. Hopefully we can end up with a small boat out to bring the seabed. Further chart Now a quick two hours sleep before breakfast, it is a long day! Nice to see them posting daily logs. Thanks for your response to me Robert. You referenced paleoclimate. Doesn’t the paleoclimate record show stable Arctic methane hydrates even at much warmer temperatures than we have today? That is my understanding. I would recommend bringing your concerns regarding methane to the open comments section of Real Climate entitled “Unforced Variations”. If one of the scientists doesn’t respond I imagine some of the well informed commenters will. Or, perhaps you have other ways of contacting Gavin Schmidt and the other scientists there. I personally have great respect for Gavin Schmidt, and know he has a reputation among other climate scientists of being very accurate with what he says. Personally, I believe there is a tendency to over hype the methane issue, but I am no expert. Archer and Schmidt are. Why not contact them? Again thanks for your response. Yeah, Archer and Schmidt are great. But they aren’t the _only_ two scientists who have looked at this issue. Mann, iirc, also has said that these concerns cannot be dismissed out of hand. It’s an area of honest disagreement among highly qualified scientists, as far as I can see. Except that none of them disagree that there is a lot of methane under there, and that it will likely eventually come out, particularly if we stay on the path with highest emission levels. To my way of looking at the big picture the methane could come from anywhere or multiple sources – it doesn’t matter where – because it will have the same effect. It could be the Arctic (land and/or sea, and apparently inevitable at some point this century or next with further warming under BAU), the increasingly irresponsible practices of the fossil fool industry, waste dumps, intensive agriculture/livestock farming, increasing forest immolations, or the ever increasing warmer wetter areas of the world. Fixating on arguments about whether or when the Arctic Pandora’s Box is or will be opened detracts from the reality that current methane levels are 2.5 x plus previous interglacials and rising again. Hansen I note isn’t dismissive of the possibility of hydrate destabilization, and his track record speaks volumes. The arguments about whether CO2 or methane deserve priority strike me as utterly vacuous and irrelevant. Methane is the turbocharger in the CO2 engine and we need strong action on both as Joe Romm argued over at Climate Progress recently. Wholeheartedly agree with this sentiment. Depends on how far back you go into the paleoclimate record. From the point of view of risk, what I look at is the fact that ever since PETM we have long term cooling and sequestration of methane stores. During previous interglacials over the last 800,000 years there may have been periods where Arctic temperatures exceeded those we see now. But, with each passing decade, those examples grow more and more in the minority. Greenland, at the current pace of warming at 1 C per decade during recent decades, may reach or exceed the 800,000 year threshold in just one or two decades. Other regions will likely be pushing the 800,000 year paleoclimate temperature limit within the next 20-50 years under BAU warming. At the point we exceed the 800,000 year threshold (probably around 1 to 1.5 C global), it would appear that a rather large volume of the stored methane is at risk — the entire permafrost methane store for a certainty and likely a portion of the subsea store as well. At 0.8 C positive, we are already seeing methane store destabilization in the permafrost. Certainly not in a high enough volume to be catastrophic. But, in my view, it’s just not rational not to be concerned about the permafrost store alone (much less sea bed stores). Now, if we were undergoing this warming over a period of many centuries, the excess methane could out-gas gradually and likely provide a much smaller net feedback due to its easy relative uptake by sinks. At the slowest, we are now warming by 0.15 C per decade globally and at a far faster rate in the Arctic. If paleoclimate has a corollary for this very rapid pace of warming in the 800,000 year record, I’m not aware of it. Most sources indicate that we are warming at a pace at least six times faster than at any other time previously observed and correlated. This faster rate puts at risk the release of higher volumes of methane over shorter periods. As such, atmospheric stores are at risk for far more rapid increases than during the 800,000 year record. So, in addition to the paleoclimate context of the Arctic, the total pace of warming is one that I don’t think we should leave out of the equation. Another concern is that warming is uneven. So though net forcing over the Arctic may well be less than previous thresholds, the high amount of heat energy being dumped into the climate system may result in exigencies locally. For example, heat avected into the ocean may create a local spike that is outside of a larger context. This is a separate risk imposed by the overall velocity of human-caused change together with an imbalance that is comparatively high. Finally, it appears we are bound under current human greenhouse gas forcing to at least hit temperature levels last seen in the range of 3 million to 10 million years ago. This puts at risk methane and carbon stores that have been sequestered since that time, over the long period of cooling. Under BAU, we put at risk the carbon store as methane sequestered during the entire period of the past 30-50 million years and we probably put that, arguably large store, at risk over a period of less than 300 years. This is a velocity that I would consider outside the realm of reasonable comfort. In my view, a narrow context, one that only looks at the past 800,000 years and only considers present warming or the warming of the past 30 years, doesn’t take into account the larger risk. Schmidt and Archer are top-rate scientists and I have the utmost respect for them. Schmidt, especially, has highlighted serious issues regarding global warming and been an amazing advocate for the science. That said, I am simply not comfortable with their stance on methane, regardless of possible over-hyping coming from other sources. My view is that taking a fixed stance and not allowing for potential risks and outcomes unforeseen by incomplete model assessments sets up a troubling blind spot and comes across as an over-all down-playing of the issue. We can well recognize hype. But we can also, as Hansen and many, many others do, take into account methane as an issue with rather high error bars and admit the need for continued observation due to both high potential harm and high uncertainty. From the perspective of emerging threats, we take into account the most likely scenario, the least likely scenario, the most harmful scenario and the scenario that is likely to be least harmful. Somewhere in this grid lies future reality. But you do not ignore the most harmful scenario, regardless of how apparently unlikely it seems at first. RE Schmidt and Archer. I would like to put them in a room with Hansen, Wadhams, S&S and a few others that have a moderate view on methane (possibly Miller) between S&A and this group. I’d like to hear them talk to each other and hash out some of the risks. Maybe I should be included for the broader perspective that I bring. But I am not a scientist. I am a threat analyst and, as such, my perspective is a bit less narrow nor (admittedly) deep. For this round table, I think Neil DeGrass Tyson would be an excellent host (as a scientist who also appears rather well aware of the risks involved with methane store release due to warming). This is a discussion that needs to be had and one that IPCC needs to pay attention to. From my limited understanding the issue that Schmidt had was with the notion of shallow methane hydrates in the ESAS. And, that those hydrates were the plugs for a 50 GT methane monster. If they melted it would be released. He stated that it was not thermodynamically possible for them to form at such shallow depths. The hydrates can be stable at shallow depths provided it is cold, but they can’t form. Typical sea floor gas hydrate stability zone is much deeper than ESAS. However, tundra has its own gas hydrate zone ranging from 120 to 350 meters approximate depth within permafrost soil. Since ESAS is submerged tundra/permafrost, it contains the old hydrate stability zone that existed before it was flooded. So its characteristics are not typical and hydrate zones are therefore shallower than they would otherwise be. In addition, you have old and new pockets of biologically formed gas at shallower depths. The issue, scientifically, appears to be whether this hydrate imbedded permafrost in the ESAS is vulnerable to warming based destabilization and how large a volume ESAS submerged permafrost contains. The depth of the hydrate zone created some doubt that it was. In addition, it seemed to me that Ruppel and others base findings on lesser volumes of hydrate stored in ESAS. S&S have shown reports with hydrate core samples and estimate a volume of 500 gigatons within the ESAS region. So the ESAS contentions involve total methane store, sources for currently observed significant but not catastrophic gas release (biotic/hydrate), how stable those stores remain, and how long those stores have been releasing significant volumes of gas. In any case, regardless of the size, stability and rate of destabilization of ESAS stores, you also have the entire permafrost store (CO2 or methane) as well as other hydrate stores throughout the Arctic and elsewhere. So there’s global risk for methane feedback from numerous sources and one that probably does not approach the null hypothesis this century due to the fact that stability for a not insignificant portion of those sources relies on climates within the range of the last 800,000 years, at best. And we are approaching and look to exceed the 800,000 year boundary within the next few decades in the context of average temperature for many regions. In the context of total energy imbalance, it’s questionable that an initial forcing has ever been as powerful as the one humans now provide. Thanks for the analysis Robert. I have been focused on the ESAS as I have been involved in a lot of Near Term Extinction debates. There is no doubt the rest of it is a mess as well. It will be interesting to see what the research expedition comes back with. I think it would be helpful if we made less exact predictions and assertions and provided more in the way ranges of likely outcomes. Assertions of certain NTE aren’t too helpful but neither is a downplay of the overall risk. We should instead acknowledge a range of risk and work to refine our understanding. In Australia we have fire danger signs that represent the risk. At the high end we have Extreme and Catastrophic. These social and environmental impacts are baked in for the term of my children. So I would say we are at Catastrophic, but that doesn’t guarantee that my house will burn down, if I have properly prepared. Anecdotally, one of my neighbours decided to go to a Ricky Martin concert instead of preparing to meet the 2013 Australian bush fire that came within a kilometre of our houses. And they have kids. I guess it depends on your perspective. I’d say we are in the age of near misses. People can sometimes become overconfident under such circumstances. If we’re at catastrophic now, we’ll probably need new levels later. Low catastrophic, mid catastrophic, high catastrophic? I guess signs are for fore-warning people, if they haven’t prepared by the time it really hits the only choice they will have, if their situation is not stable, will be to move. Looked at this quite a bit in the raw MODIS data yesterday. Wind appears to have shifted to the north today, but those fires still rage. Thanks for chiming in, Peter. It’s good to hear news on CARVE. I’ll update the post accordingly. Just followed the ABOVE twitter site. RE CARVE… Are updates on mission progress available somewhere? The last time I dropped by, the CARVE site still showed rather old press statements. Also, will you be posting CARVE updates on the ABOVE twitter page? An important thing to consider regarding methane is, to reference James Hansen, that our planet has become a giant science experiment that has no control experiment running as a baseline next to it. The situation in the Arctic is evolving rapidly. No one would argue that. This results in conditions that have never been encountered or studied before in human history. Scientists can look to the past for an analog, but with the speed at which conditions are changing, the analog becomes little more than an educated guess. What actually happens at the ground level is bound to give up some surprises simply because the inputs to the experiment have not been forecast, such as massive wildfires occurring on a scale that was previously considered out of bounds to the equation. While Archer and Schmidt are brilliant minds and obviously well informed and educated, in the case of current methane states, they have become a bit like seasoned firefighters that are describing a control burn that is being lit in an area that no one is watching. They have a good idea of how things will go, but local conditions will dictate the actual course the fire will take. Sometimes things can get out of hand due to the unpredictable circumstances involved. There is a risk. Which brings me around to the risk involved. We know that it is there, methane has the ability to dramatically alter the state of energy balance for the planet. It is also easy to see that the situation does not have the level of scientific resources devoted to it that we are capable of. Considering the consequences, it would be foolish for anyone with a going interest in the future state of our environment to dismiss the threat out of reassurances based on past Paleo record. The very existence of vast amounts of stored methane makes those deposits exactly that, a threat, to all of us. Roberts background, not only in science, but also military intelligence and emerging threat identification is, to me, invaluable to his unique perspective expressed in this blog. At some point, likely far behind us now, the greenhouse effect goes beyond science. That, (and the wonderful comments of the readers) is what keeps me checking this blog many times a day. This is precisely the correct way to look at things. The purpose of climate change research should not be to make predictive models, it should be to identify risk. While I appreciate that the IPCC at least notes catastrophic change risk, it is disheartening that it still focuses on steady state dynamics instead of risk dynamics. During Fukushima I wrote that I didn’t believe the safety systems would work because the models were built on flawed assumptions of independence and steady state. I learned this fact from a documentary by Adam Curtis called Pandora’s Box, which was recorded in the 90s and presaged the meltdown. A few readers asked why I trusted the climate change models. I answered that it was simple: the climate change models only needed to be accurate enough to realize there was a high risk of catastrophic change, while the nuclear plant models had to be accurate enough for pinpoint control. Similarly, I wouldn’t trust the climate models at all to help guide geoengineering. Your comment really highlights that science in general (and climate research in particular) should differentiate between areas that are predictable and areas that are fundamentally unknowable because they exist outside observable conditions. That said, I recognize that even the conservative IPCC is brushed as radical and a different framing might not help. But who knows, it may also lead to more radical calls for change by those that accept reality. Good points, G & M. My short way of saying it is that I generally trust scientists more when they are telling me what to worry about than when they are telling me not to worry about something. About the most basic, well understood, straightforward physical process imaginable is melting ice. Yet every single model for the time frame for Arctic sea ice melt was wildly wrong, and that was ice that was viewable from above, below and ‘inside’ (via buoy data). We have much less knowledge about the dynamics of the various layers of permafrost, clathrates, free methane and other assorted junk, with great topographical variation, hidden by many meters of water in hard-to-navigate seas, for the few weeks that they aren’t also hidden below ice. And now with increased biological activity on top of it all, I’m not sure how anyone can be very confident about how this thing will respond, after millennia of warming, to a further rapid heating of the area, both from direct insolation and from shifting currents, and under a much more turbulence sea surface. Fantastic comments Wili, Mikkel and Griffin. In my view, very well thought out. For the layman and global warming due to greenhouse gases accumulating in the atmosphere, I think the general lack of understanding of the carbon cycle and how it works over geologic time periods as well as shorter times periods seems to be a big sticking point for most people. I remember years back when global warming broke as a news story, the Scientific American began to run background stories on the earth’s great carbon cycles and how they make a great impact on earth’s climate overall. These were great articles showing how carbon is sequestered in many ways and how plate tectonics can bring carbon back to the atmosphere via volcanic activity and how things like mountain formation and erosion can change Co2 levels via putting more erosion and rock surface to contact with the atmosphere. Especially interesting were the stories of earth’s great natural climate changes. If people understood that we people are now acting just like a natural source to expose carbon by digging and pumping it up, burning it and thus putting fossil carbon into the atmosphere. We HAVE to be changing climate because earth’s systems have changed it naturally in the past, and now we are doing the same by just a slightly different method. Bottom line is sequestered carbon that belongs in the earth as part of the carbon cycle’s balance favorable to life is now disrupted and we do the work of putting that carbon where it does not belong. I know many intelligent people, but I know hardly anyone with knowledge of how the cycle of carbon makes earth liveable. Deniers of course laugh at the idea, while claiming natural processes change climate all the time, they say human’s taking carbon and putting it in the atmosphere can’t change climate. Illogical in the extreme, this requires magical thinking to believe human burning of fossil fuels will not disrupt the natural climate and it’s cycles. Basic physics does not penetrate the media smoke screen that really does run cover for the fossil fuel industry. I always argue that if people understood the basics of the carbon cycle, they would by nature believe the carbon crisis we are in. Thank you for posting the link to your video Peter. It is a wonderful communication tool, simple yet highly effective! Very well done. Well done, Peter. Simple, direct, informative. Agree. Tweet scheduled. Nice job! @ scribbler I’ll talk to Chip and see if he has anything I can tweet about. Maybe it’s just me , but these fires smoke plumes this summer are more gray . And thicker. In both Siberia, and Canada . I really wish someone would visit some of these sites and record just how deep into the ground these things are burning now. To me, this is key feedback loop. These places have always burned, but if they are burning 4 to 6 feet into the ground now this is a new state. We really need a kid to march out and take samples . How deep are these fires burning ? Good question. But from the smoke signatures, I’d say rather deep. 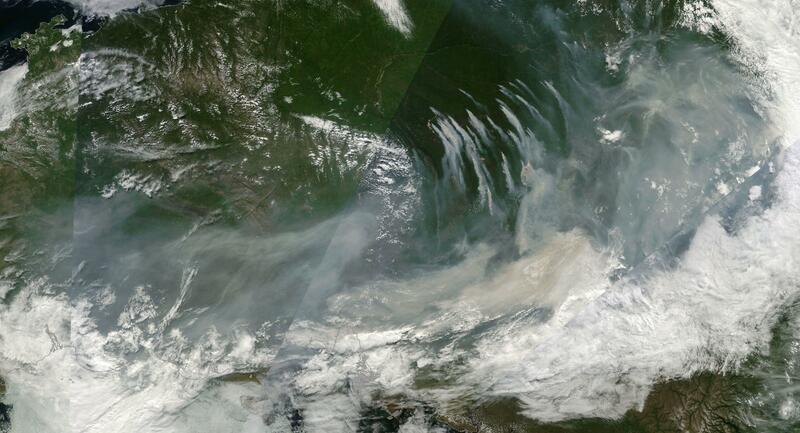 Smoke plumes feeding into storms over the Chukchi… 994 at center now. Gale force gusts. Worth watching. Bob — you notice that we’ve had a million acres burn in Washington and Oregon this week? Amazing when you consider a record fire year for the US is 6 million acres. Robert. compare the crater footage with the soil features from another permafrost video, see both videos, http://climatestate.com/2014/07/19/permafrost-thaw-and-the-jamal-sink-hole-siberia/ Looks very similar, looking at the surface formations. The Jamal crater video could replace this post video, since it is no longer available. Cheers. Extreme heat, 20 – 30 C above normal, predicted for parts of northern Canada and for Greenland in the next few days. Should get…interesting. Robert, please let us know how extreme the heat anomalies become with this far northern heat wave. Back to the office… Thanks. Keeping an eye on it. The range is a peak of 18.4 C (65 F) near Nuuk to -9 C (15 F) near summit. Warm winds blowing off of Canada and Quebec are funneling up Baffin Bay. The high over Greenland also contributes to warming. We have above freezing temps all along the northern section of Greenland and running deep into the interior over the Petermann and Zachariae Glaciers. For context, the highest temperature ever recorded for Greenland is 78 F and above freezing temps over the ice sheet are rare. Will be blogging about this today or tomorrow as conditions warrant. Highest temp visible now at 69 F in Greenland. That’s about 17 F above average highs with a few hours of warming still to go. As noted above, the all-time record for Greenland is 78 F (2013). NOAA June temps at .72. Hottest June global surface temps on record. 2010 was second at .69. I guess this is one of those times where NOAA differs a bit from NASA. NASA was a close 3rd for June temps. The regular June press release isn’t out just yet but you can find the data in the link below. 2014 is now tied for the 3rd warmest year to date. It is behind the El Nino years 1998 and 2010. This could have been predicted based on the high MEI values for April and May now showing up in the surface temperatures. The key question now is what will the 2nd half of 2014 look like? Do we need an El Nino to have the hottest year on record or are their good odds that the Northern Hemisphere’s fall temps will put us over the top. It’s a good question as El Niño now appears weak or in doubt. Without the added push provided by El Niño air temps will probably stay close to recently observed values even if there is a new record. Just how did that darn El Nino lose it’s umph so quickly? Negative phase of the Kelvin wave, intermittent atmospheric feedback. Though the initial Kelvin wave was strong, it did not receive the kind of atmospheric support necessary to decisively push toward strong El Nino. There were times when it looked like that might happen, but so far it hasn’t panned out. The longer we go without decisive atmospheric feedback, the more likely the event will be moderate, weak, or even a fizzle. We do have warm, deep water formation from another down-welling Kelvin wave. But it appears we may go through a period of closer to ENSO neutral SSTs even if this second Kelvin wave is a strong one. The current NOAA forecast is a for a weak to moderate El Nino. But it’s possible that, without consistent atmospheric feedback, this El Nino could fizzle entirely. One of the more accurate forecasters thinks just this will happen. Currently, Pacific Equatorial SSTs are in the range of +0.70 positive anomaly with the Nino zones all showing declines over the past week. All measures show us on the positive side of ENSO neutral but we’re not quite in El Nino range even now. So the risk of strong El Nino at this time has fallen significantly. Probably good news overall, but very bad news for those hoping for rain this winter in the western US. Meanwhile, Pacific Ocean and world ocean heat content is likely to continue to build proportionately to the weakness or lack of El Nino this year. We may be dodging a bullet for strong warming this year, but the load in the chamber remains and will likely grow larger until we do see a good portion of that heat backing up into the atmosphere. Robert, I always here about the buildup of heat in the western pacific. The question I never see answered is how much of that added energy simply diffuses into the deeper oceans? I have no doubt about the “spring loading” of heat that is occurring but wonder how much never returns to the surface. Is El Niño entirely a natural variation or can increased El Niño frequency itself act as a climate forcing in terms of its influence on cloud formation? A huge amount goes into the deep ocean as evaporation increases salinity and the hot top layer just dives deeper and deeper. Recently a portion of this deep ocean warming has been backing up beneath Antarctica where warm water upwelling has become more common. So, warming the deep ocean is fueling basal melt there. If the ocean-atmosphere interplay dies down, a larger portion of the heat goes into the deep ocean. And that’s a rather bad scenario for ocean health (increases stratification, anoxia, and hydrogen sulfide production while also making deep ocean hydrate stores more vulnerable). There may be a tilting of the system that prefers deep ocean warming to atmospheric warming. We won’t really know this until PDO tips positive or if we end up with more La Nina type events than El Ninos going forward. The current negative PDO phase is still within typical bounds. That said, the Trenberth numbers on deep ocean warming show a rather extreme spike over the past decade. As for El Nino as a natural variation — as we have observed thus far, yes. We’re not quite certain what happens to El Nino in a warming climate. Some studies have indicated we see a higher prevalence of El Nino conditions. But one does wonder if the atmosphere-ocean heat transfer doesn’t run more toward La Nina due to initial atmospheric forcing from ghg. At the weather level, we have seen an increase in the formation of strong high pressure systems. Some of the strongest of these have formed over the temperate and subtropical Pacific. The net effect of deeper highs is to increase the trades which would suppress El Nino and drive more heat into the oceans. Unless you break ocean circulation entirely, you’d expect a backing up of the hot water to force a strong atmospheric feedback and produce El Nino. This year and last year, however, though the warm water was present in the ocean, the atmospheric feedback did not occur. If we continue to see strong Kelvin waves stifled by a lack of atmospheric feedback, then the above questions may well be ones worth asking. Thanks, great explanation. I think from this point forward if we don’t get any El Niño ‘s, neutral years will begin breaking records every other year. I also don’t think we will ever have a year as cold as 2011 or even 2012 if I may be so bold. Assuming no volcanos of course. Are there any observations regarding Greenland Ice Sheet giving icemass off buffering the loss of sea ice? About the rate of GIS iceloss through this negative feedback? I think the same phenomenon hides in the background of record antarctic sea ice EXTENT. Do we have the numbers on sea ice VOLUMEs in the antarctic? There’s no Antarctic sea ice volume measure at present. So we don’t know, overall, how extent and area growth compare to volume at present. Growing gross and net ice and freshwater outflows from GIS and Antarctica are bound to have some negative feedback effect. Current values are much larger than in the past but are likely far smaller than they will be by mid century. That said, I think it would be worthwhile to attempt to model the negative feedback now so we can establish a baseline. My view is that sea ice is probably rather sensitive to even minor changes in conditions. So it’s possible that the extra fresh water from Greenland may be having an effect on recent summers in the Arctic Ocean. That said, ice retention in Baffin Bay and in the region east of Greenland has been poor. Meanwhile, fresh water content has been increasing in the Beaufort Sea possibly due to a combined increase in precipitation throughout the continental Arctic and due to ice melt in Northern Greenland and the CAA. A large negative feedback from Greenland could be characterized by increasing sea ice retention adjacent to Greenland even as sea ice falls in other regions of the Arctic. A few papers have shown that basal melt, calving, and ice sheet loss in Antarctica is freshening surface waters and is likely contributing to the sea ice growth we are seeing in that region. Then, as for the whole arctic and antarctic systems, these are to be seen rather critical as “negative feedbacks”- if I well understood – with regards to “all- in” ice cover and the whole dynamics. Especially, that this won’t have any effect on methane release in the melt- exposed Laptev and Kara seas. That’s rather uncertain. But it is most likely that the negative feedback would be local to the near-GIS environment. Laptev, Kara and ESAS are a bit far afield and in some model predictions we see warm air invasions having more influence over those regions even as melt drives relative local cooling in the ocean zones near Greenland. Thanks A4R! Good stuff. Any word on a fundraiser for MethaneTracker? Thank you for this, A4R. I suppose I’ve been digging in all the wrong places. In any case, this is definitely worth a follow up blog. Will start work tonight. Best to you and warmest regards. RE: METOP. I do agree that the format and quality of this information has improved. In general, it’s good to see that efforts are ongoing. I’d been concerned with the CARVE page press releases went dark and didn’t see that they’d come under the aegis of ABOVE. The loss of AIRS data accessibility was disappointing and the overall tone of some of the science with regards to methane led me to believe that some of the research may have been taken off priority. ESRL update lag was also a bit disconcerting. These various expeditions and investigations provide quite a bit to cover. So I’ll be happy to dig in. Again, thanks for the update.